The School of Aerospace, Mechanical, & Mechatronic Engineering at The University of Sydney has a useful set of course notes, �Aerodynamics for Students�; see especially �Part 3: Aerodynamics�. The book Theory of Wing Sections by I. H. Abbott & A. E. von Doenhoff (Dover 1959, ISBN 0486605868) is highly recommended, both as a summary of the aerodynamics of wings and as a source of data on the NACA aerofoils. There are several copies in the University of Sydney Engineering Library, and the book is still in print and can be ordered from the publisher, or you can try to find it at BookFinder.com. I. H. Abbott, A. E. von Doenhoff, & L. S. Stivers, Jr. 1933 Summary of Airfoil Data, NACA Report No. 824.
which is now in the public domain. It's available from http://naca.larc.nasa.gov/reports/1945/naca-report-824/, but at 20M, the PDF is a large download. L. Prandtl 1921 Applications of modern hydrodynamics to aeronautics, NACA Report No. 116. <PDF (3.7 M)>. R. F. Anderson 1936 Determination of the characteristics of tapered wings, NACA Report No. 572. <PDF (1.5 M)>. J. C. Sivells & R. H. Neely 1947 Method for calculating wing characteristics by lifting-line theory using nonlinear section lift data. NACA Report No. 865. <PDF (1.5 M)>. W. A. Stevens, S. H. Goradia, J. A. Braden 1983 Mathematical model for two-dimensional multi-component airfoils in viscous flow. NASA Contractor Report CR-1843. See also the NASA Technical Report Server for other work. J. J. Bertin 2002 Aerodynamics for Engineers, 4th edn, Prentice Hall. H. Glauert 1947 The Elements of Aerofoil and Airscrew Theory, 2nd edition, Cambridge University Press. J. Katz & A. Plotkin 2001 Low-Speed Aerodynamics, 2nd edition, Cambridge University Press. A. M. Kuethe & Chuen-Yen Chow 1998 Foundations of Aerodynamics, 5th edn, Wiley. J. Moran 1984 An Introduction to Theoretical and Computational Aerodynamics, Wiley. (Republished 2003 by Dover.) Find it at BookFinder.com. L. Prandtl & O. G. Tietjens 1957 Applied Hydro- and Aeromechanics, Dover. ISBN 048660375X. 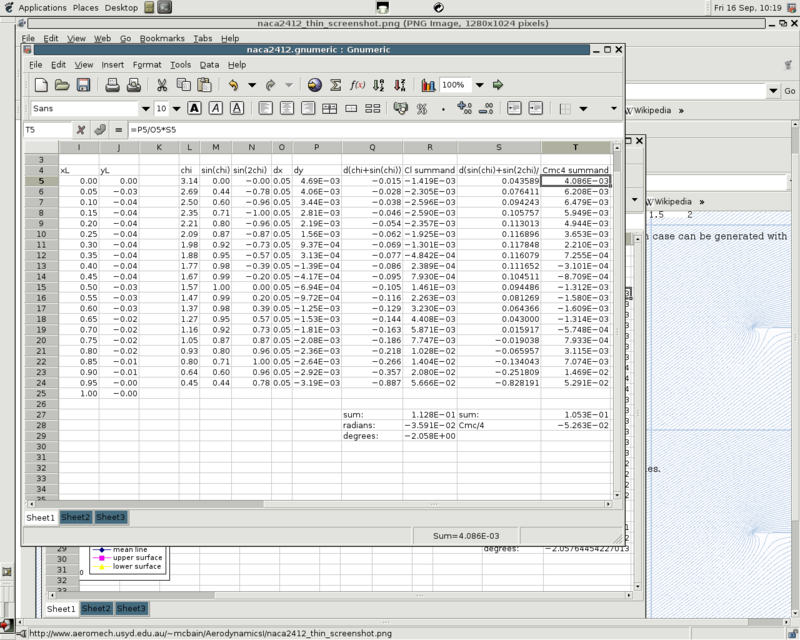 screenshot�computing a NACA 4-digit profile using a Gnumeric spreadsheet, following the equations from Jacobs, Ward, & Pinkerton (1933) (which is partially visible in the right of the shot) or Abbott & von Doenhoff (1959, pp. 112�114). The spreadsheet can also be used to approximate the thin aerofoil theoretic zero-lift incidence α0 and quarter-chord pitching moment coefficient Cmc/4 (screenshot). �On a perfect day, beware the vortex�, by E. Tadros & D. Smith (24 May 2005, Sydney Morning Herald), featuring quotes from Dr Peter Gibbens. 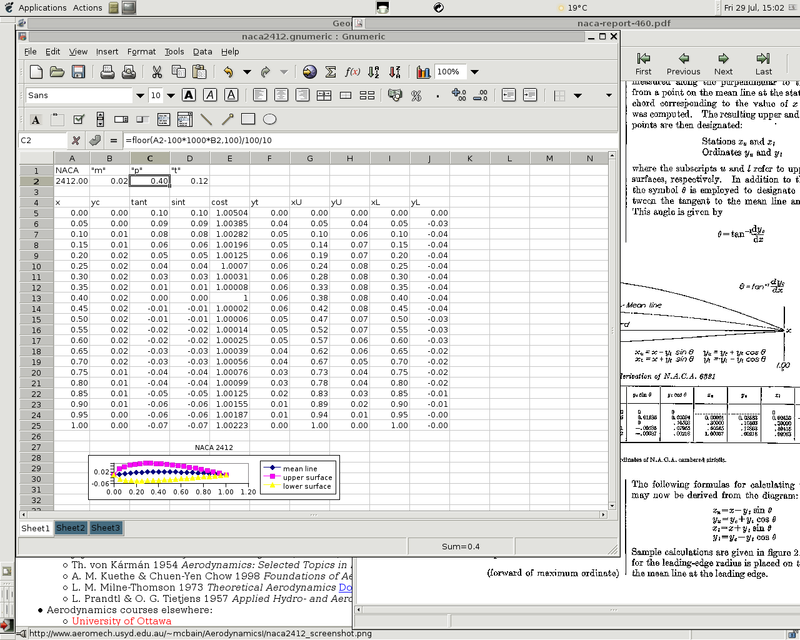 Miscellaneous aerodynamical programs written in GNU Octave and freely redistributable under the terms of the GNU General Public Licence (GPL). Compiling XFOIL on Debian GNU/Linux: I found that I had to make the following changes to the configuration files. AVL:� a vortex-lattice method code. To compile this, I commented out FC = ifort in plotlib/config.make and eispack/Makefile . �More conformal mappings�, by O. S. Kerr of City University, London. A numerical conformal mapping program zipper, with Fortran and C source, written by D. E. Marshall of The University of Washington. P. B. S. Lissaman & C. A. Shollenberger 1970 Formation flight of birds. Science 168: 1003-1005. A. M. Kuethe & Chuen-Yen Chow 1998 Foundations of Aerodynamics, 5th edn, Wiley, pp. 213-215. K. Williams 1999 Formation flight learns form the birds. The Dryden X-Press 41(4), 26 Feb.
H. Weimerskirch, J. Martin, Y. Clerquin, P. Alexandre, & S. Jirakova 2001 Energy saving in flight formation. Nature 413:697-698. Steve Yanoviak's work on gliding ants was reported by Elizabeth Svoboda in her article �Wingless gliders may reveal the origins of insect flight� in the New York Times on 4 Apr. 2006. Last modified Tue. 29 May 2007 by Geordie McBain.